Last week was big. I flew up home for the first time since Christmas (it’s easy to be wayward when time moves so ridiculously fast, I for one refuse to believe it’s any later than June. And certainly not October) and enjoyed wonderful, necessary quality time with family both immediate and extended, including the cats Roger and Poppy. Who were not entirely averse to my nuzzles. This is Poppy. She looks like Roger, also a tabby. You can tell who is who though, because Roger’s always studiously trying to be left alone and Poppy’s always fixing to shred you like a confidential document. I then met with friends on a sneaky weekend trip to Auckland, where we managed to halt the process of time somehow – unless it moves differently up there – and fit in a million different joyful activities, including magnificent brunch and endless coffee at Federal, hanging at Flash City, eating ice cream at The Dairy, drinking lunch beers at Tin Soldier, and trying on fancy beautiful dresses at Miss Crab. As well as that I met up for a coffee with rapper/poet Tourettes, which put the cool in “be cool” and that was all just Saturday, before we had a group snooze and pre-show beers and snacks and then saw WICKED. This was to be my third time seeing this musical, the first momentous occasion happening in London in 2011 and then again in New York City just a year ago. Having bawled so hard that I needed electrolyte replacement previously, I was prepared for more of the same, but managed to stay quite dry-faced for the most of it. Tears appeared, however, in I’m Not That Girl, (ughhh the poignancy) One Short Day (they’re just such good friends!) and verily rained down during For Good (just run away together!) It was an incredible production, the cast was amazing, and – we are a tiny country – it was kinda neat to have such a juggernaut, a real proper modern Broadway show, here in New Zealand at roughly the same scale it should be. And even though I know every beat and tick of this show off by heart, nothing ever prepares me for the said-heart-dissolving experience of the end of Defying Gravity. Okay, I think I cried in that one, too. I hadn’t been to Auckland since November last year, which seems odd when I say it like that, but it’s just how it has happened. So it was exciting to rush around and take in all the things it has and to feel all bright-lights-big-city (I adore Wellington, but it is wee.) Through some well-earned serendipity and just enough planning we managed to get into almost everywhere we wanted (except Depot – but hey) without delay, there were always carparks and everything we ate, from the swankest brunch to the most rapidly cooling fries-stuffed cheeseburgers with wine and beer at the kitchen table, was so, so excellent. Speaking of eating excellent things: I had this idea recently, that mixing blueberries with a lot of aggressive yet balanced savoury ingredients could produce something quite delicious. 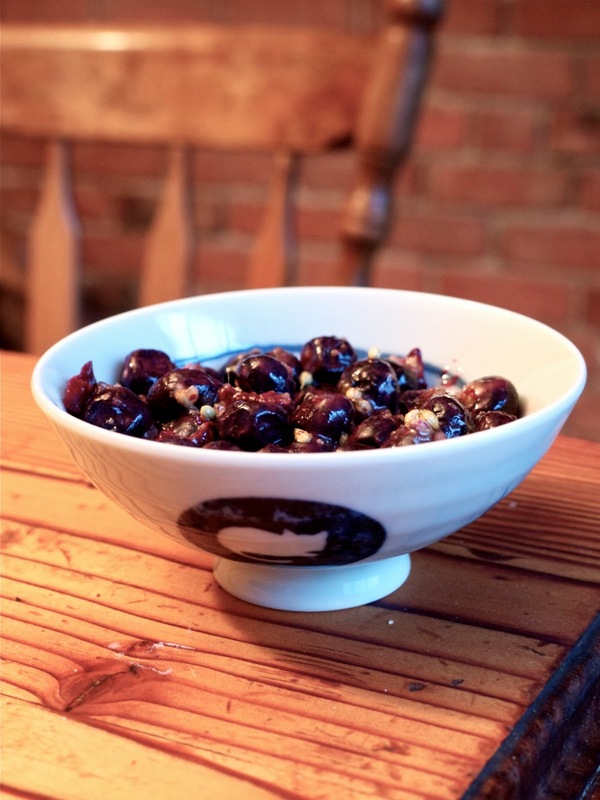 I was correct – blueberries, sitting around in olive oil, lime juice, vinegar, spices, chilli, are so compelling, so head-shakingly correct together, that I nearly ate the lot before I even worked out what they were supposed to be. 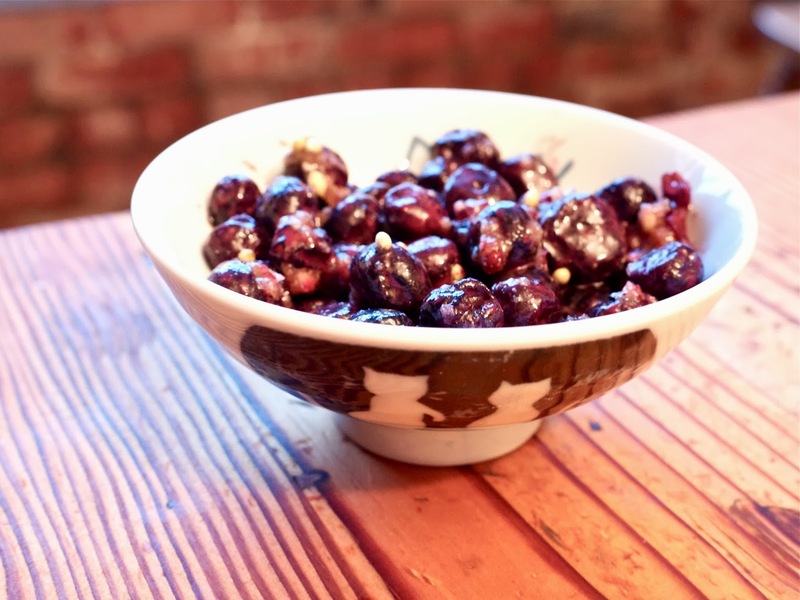 I called them pickled blueberries, but was it enough to just make them and eat them? I didn’t think they’d work with chicken, steak and fruit is a derisive no, lamb – not quite, duck – too expensive, salmon – maybe? And then I had the idea to pair them with a chickpeas, their similar shape appealing to me, plus lots of creamy, rich, sharp feta, and to just build a salad from there. And it was the nicest thing ever. Blueberries have a particular sweetness, different to the jamminess of strawberries or the particular sour tang of raspberries – it’s more subtly floral and muted. So, slightly unsettling though this recipe might sound, they actually work so well with all these strong flavours and textures, their blue juiciness bursting in your mouth with a rush of salt and sourness. If the berries are frozen, allow them to defrost in a bowl, otherwise simply mix together all the ingredients, taste to see if you think it needs more salt, sugar, oil or vinegar, then leave to sit for at least ten minutes at room temperature before eating. They last around a week in the fridge, although the texture of the oil goes a bit odd when it’s that cold it’s certainly still very, very, thrice very edible. I then stirred about 1/2 a cup of the berries into a salad along with 1 drained can of chickpeas, a few handfuls of handful of baby spinach leaves, one finely sliced and overpriced capsicum, an entire damn packet of feta, roughly crumbled, plus some more olive oil and coriander seeds and a generous spoonful of fried shallots from a packet. 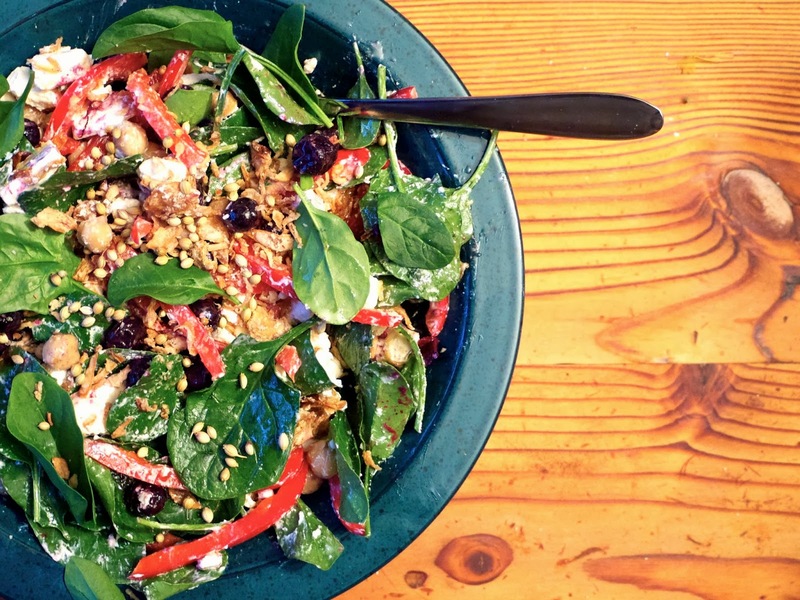 It was a wondrous combination – crispness and crunch of the juicy, fresh kind and the fried, brittle kind; the sweet blueberries against the creamy salty feta and the bite of chili against everything, really. Am still delighting in being a real cookbook author. In fact, I’m currently trying to organise an Auckland launch party for my cookbook, so get in touch if you want to give me a ton of premium champagne for free. If not: don’t bother (oh my gosh, kidding, I’ve had so much lovely feedback and correspondence from people about the cookbook and it’s the sweetest, kindest, heart-swellingest thing ever. Much sweeter than champagne.) Am still also not winning the gold medal for sleeping decently, in fact am somehow getting even worse at this sleeping regularly thing. But: getting there, slowly. One day at a time. title via: Blue Velvet. Obsessed with Lana Del Rey’s cover of it. The never-not-astounding Lorde’s 400 Lux. Got a lot to not do. Sky Ferreira, You’re Not The One. I love the enormous drums and spaciousness and general perfection of it all. 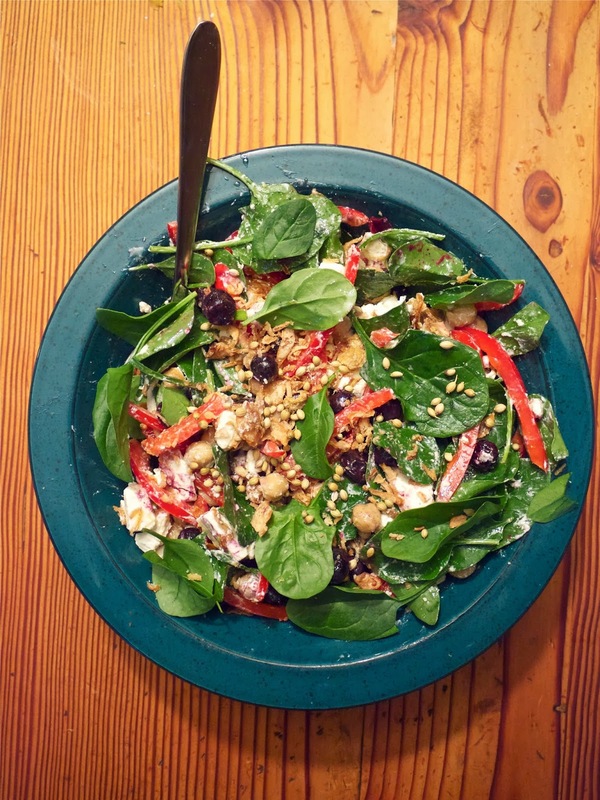 Sounds ridiculously delicious, I'm overjoyed about the impending summer salad season. Loving the cat photos! Holy smokes!! Laurababe, this is amazing. And yet for as wonderful as the pickled blueberries must be, what really makes my heart pang is that you got to visit your family. It's been 14 months for me now. I miss mine. That sounds lovely! Would be excellent with pork too. Yeah but…now that you've said it, I can't get it out of my head – a savory blueberry compote on steak actually sounds quite good! Or how about on a burger with goat cheese?? Your friend-ly adventures sound so fun. I need me some time running about in the towns I miss. Also, that is the softest-looking kitty ever! Ooh actually maybe Foodycat nailed it with the pork idea. We used to have pork roasted with apples and raisins on top when I was growing up. These sound tastier than the pickled blueberries I made last year! Mine were good, but yours sound great! Cats cats cats cats cats, gimme more cats. Please. Emma!?!?!?! I can't believe I forgot that I read about these on your blog. Sorry bout that, the brain sometimes hides the origins of where one finds things out. So…thanks for planting such an excellent idea in my head!